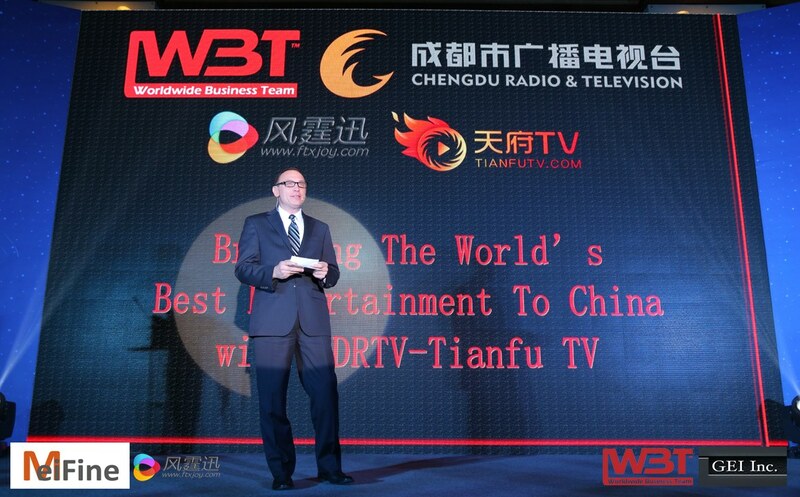 Craig Santy, CEO of Great Eastern International addressing global media leaders at CIAVC as part of the launch of China's largest digital entertainment portal - MEIFine. WARNING: All online sites and broadcasters must have a SAPPRFT license for every piece of foreign content coming into CHINA. If you want your foreign-based content to be licensed in China, there is ONLY one "Green Channel" available: Great Eastern International (Craig Santy) and Worldwide Business Team (Steve Wang). 2. 60-90 days approval of SAPPRFT License "Green Channel" vs. more than 1 year for approval via government counters. All content MUST have SAPPRFT (State Administration of Radio, Film & Television) license to be broadcast on TV as well as IPTV, OTT, Cable TV, VOD, etc.. Strict enforcement of these regulations has already begun. Foreign entertainment companies are prohibited from passing any content into China through private distribution partners without SAPPRFT approval. These regulations will cover all new content as well as all preexisting content. Basically, if it does not have a SAPPRFT license, it cannot be broadcast anywhere in any form on any platform. Great Eastern International Inc. and Worldwide Business Team, on behalf of #MEIFine are working with top entertainment companies around the world to ensure they are in compliance with the new regulations moving forward. This new China Law has some serious positive ramifications. First, massive amounts of free content, improperly distributed are being removed from the market, making it necessary for consumers to use legal sites to access premium legal content moving forward. Second, these actions reduce the amount of competition for eyeballs from illegal content- as only licensed and legally imported content with a quota slot can be monetized. Third, a new government owned digital portal known as MEIFine offers foreign and domestic content companies the ability to legally monetize large amounts of content in China through a lucrative revenue-share model working with over 90 of China’s largest digital platform operators and broadcasters (many of them government owned) reaching some 700 Million consumers daily. The program, launched by SAPPRFT in December of 2016 is being administered by Chengdu Audio and Video Publishing House (a division of SAPPRFT) with Steve Wang of Worldwide Business Team and Craig Santy of Great Eastern International handling on-boarding and licensing for all foreign content on MEIFine. High-level talks have been taking place around the world and in China since January of 2017 as the world’s top media companies learn about SAPPRFT’s new regulations, programs and how to become a part of the MEIFine portal. Great Eastern International Inc. along with Worldwide Business Team Inc. are the exclusive representatives for MEIFine. MEIFine is China's only nationwide cloud-based digital entertainment distribution portal formed by an alliance of top global media companies and the Chinese Government serving 700 million daily users. Robert Chaen and Craig Santy has teamed up to create Chaen-Santy Media (USA) to create branded content, reality TV shows, events, films, and videos. Craig Santy is an American film & television producer with many popular TV series and movies to his credit. Craig has launched many series for top networks (“Crime 360 “A&E, “Hell On The Highway” NatGeo, “Modern Girl’s Guide To Life” Style Network, “Miami Slice” Bravo, “Hogan Knows Best”, Vh-1) and specializes in taking projects from concept through completion. Craig is currently involved in the production of a “transformational” TV Series for the United States. Starring Stephen Baldwin, as well as 2 feature films with themes about “achieving your ultimate potential” to be filmed in Asia for global release with an international cast. Craig has considerable experience working in Asia serving as an East-West liaison for major films, TV series and brand projects. In China he recently provided production services for the Hollywood blockbuster “Looper” with Bruce Willis & Joseph Gordon-Levitt, as well as marketing services for films like “RED”, “Resident Evil 4” and “Repeat I Love You” (影⼦子愛⼈人).